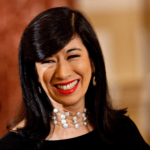 Andrea Jung is a Canadian-American executive, non-profit leader, and prominent women’s-issues supporter. In April, 2014, she became President and CEO of Grameen America, a nonprofit micro finance organization founded by Nobel Peace Prize winner, Muhammad Yunus. Grameen is the fastest-growing micro finance organization in the United States, providing the largest number of micro finance loans to individuals and small businesses. From 1999 until 2012, she served as the first female CEO and Chairwoman of Avon Products, Inc., a multi-level marketing company. Jung was also the first woman to serve as Chairman of the Cosmetic, Toiletry & Fragrance Association, and Chairman of the World Federation of Direct Selling Associations. "When a woman earns a dollar, the payback is higher. She’ll invest in her children, in their education, health care, and basic needs. The impact of a woman’s role in the economy benefits society at large." "If you feel like it’s difficult to change, you will probably have a harder time succeeding." "There are pros and cons of experience. A con is that you can’t look at the business with a fresh pair of eyes and as objectively as if you were a new CEO. Fire yourself on a Friday night and come in on Monday morning as if a search firm put you there as a turn-around leader. Can you be objective and make the bold change?" "Women like myself, CEOs, can pave the way for more women to get to the top." "The game in beauty is changing so much, if your product isn’t high tech or can’t make a unique performance claim – plump your lips, reduce your lines, look glossy, and stay on for 24 hours – you can’t go to market today. I’m not just talking about a $20 lipstick, but a $5 lipstick!" "Avon is a unique place to work; we’ve got family-friendly policies. We have more senior women in high-level management than any other company; 46 percent of our officers are women." "Avon invented the concept of direct marketing and direct selling beauty. And that’s still very valid to us. We’ll have a firm that will be around for another 114 years as strongly as it was the first 114." "A representative is free delivery; she’s a personal beauty consultant. Some people want that high touch."